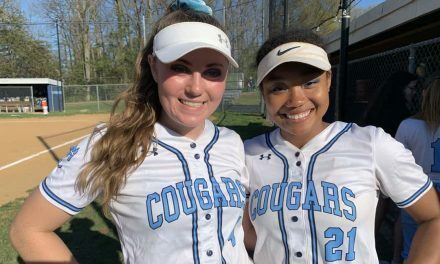 April 18, 2019 — Severna Park softball player Campbell Kline, the 2018 Varsity Sports Network Player of the Year, got her 167th Career Hit on Wednesday, putting her ahead of the MPSSAA State record pace for career hits. 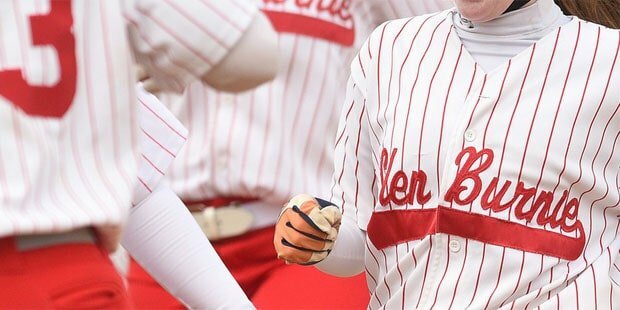 Kline has amasses 167 hits in 269 career at bats, a .621 average, since her high school debut in 2017. She also has 17 home runs and 91 RBI’s. 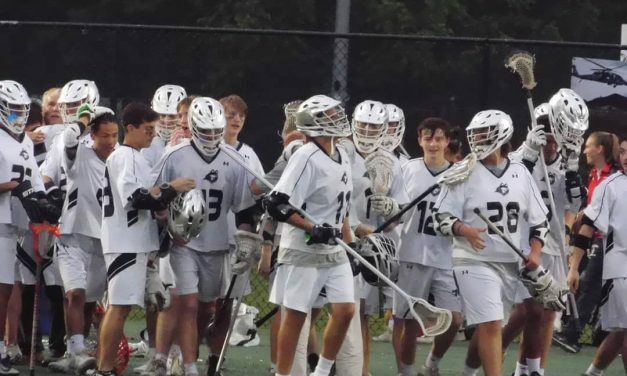 April 3, 2019 — Concordia Prep senior lacrosse player Connor Wright scored his 100th career goal on Wednesday in the Saints’ 5-4 win over Our Lady of Mount Carmel. Wright was presented the ball he used to score the historic goal by his head coach Stephen Berger. 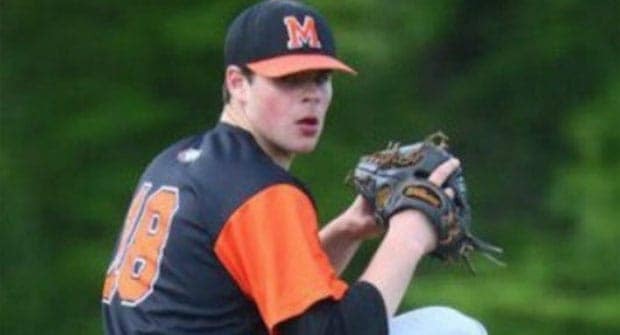 April 2, 2019 -- McDonogh baseball powered by a 2-run home run off the bat of Joe Radek, defeated St. Paul's, 9-4, for the Eagles' first MIAA A Conference baseball win on the season. 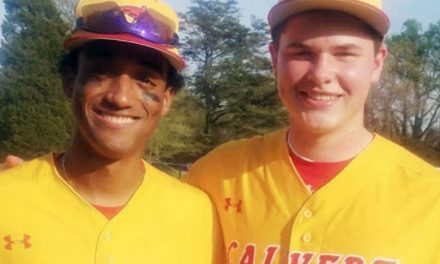 Kyle Whitaker added a 2-run single for McDonogh, while Brian Nevin provided two hits and two RBI's. Matt Spind turned in a solid five inning start for the Eagles, surrendering just two runs. March 29, 2019 -- Patterson Mill sophmore pitcher Dakota Pitts returned to the circle for the first time this year, after posting a 10-3 record last season, and picked up where she left off, helping the Huskies defeat North Harford, 6-3, in UCBAC softball action. Pitts only allowed one hit and two walks thru seven innings while striking out eight. At the plate, Pitts reached base safely three times, scoring twice and hitting a sacrifice-fly to help her cause. Madison Knight added a triple, a walk and two runs scored. In addition, Allie Cichocki had a hit and scored a run for the Huskies. 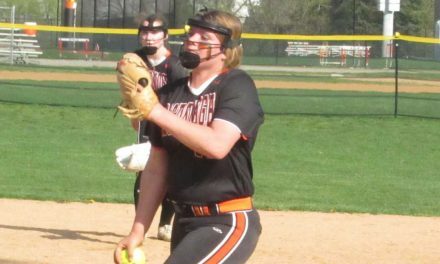 March 29, 2019 — Drew Kalista knocked in the winning run with a fifth inning single and then came on to pitch with one down in the seventh to get a save as Fallston upset No. 5 Dulaney, 2-1, in a non-league baseball game on Friday. Trailing 1-0 in the third, Andrew Noyes had a leadoff double for the Cougars and then scored on a one-out single by Alex Baily (2-for-3). Starting pitcher Connor Pickle allowed one run in four innings to get the win. Connor Stewart was 3-for-3 with a walk for Dulaney. 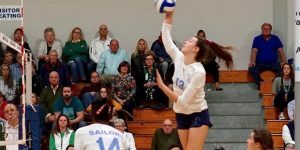 March 25, 2019 -- Mount de Sales volleyball player and outside hitter Mary Grace Goyena has been selected as a member of the 2018 Soph 79 list of the 79 best sophomore volleyball players in the nation, as compiled by PrepVolleyball.com. Her Mount de Sales teammate, middle hitter Chidinma Onukwugha was also recognized by PV in the “Highest Honorable Mention” category. The Sailors won their second consecutive IAAM A Conference championship in the fall. March 11, 2019 -- Former Boys’ Latin golfer Bennet Wisner placed second in last weekend’s PGA Tour Canada Qualifier, earning him a fully-exempt status to participate in PGA Tour Canada’s first six events of the 2019 season. Wisner is a 2014 graduate of BL. March 3, 2019 -- Congratulations to Concordia Prep girls basketball player Sarah Franker, the first formally announced 2019 Unsung Hero nominee. In the coming weeks we will be the announcing the names of all of our 2019 nominees, leading up to the 2019 Unsung Hero Awards, which take place May 13, 2019 at Martin's Valley Mansion in Cockeysville. Olympian Lolo Jones will serve as keynote speaker this year. March 2, 2019 -- Breaking: Sunday's BCL Tournament Championship game between St. Frances and St. Maria Goretti, at Loyola University, has been postponed until Tuesday evening at 7:00 p.m., due to the inclement weather in the forecast. 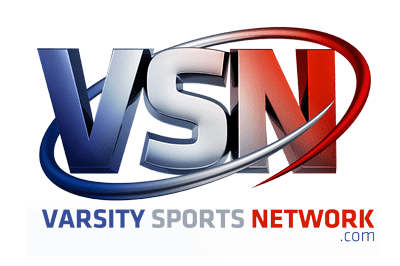 VSN will live stream the contest, via pay per view, on Tuesday. Access the feed by clicking the link at the top of this page. 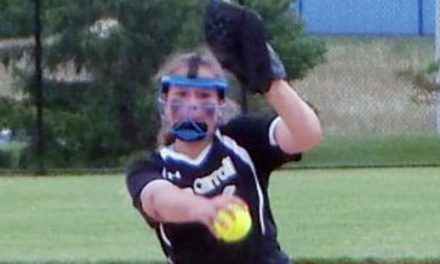 Feb. 14, 2019 -- North Harford senior Jess Smith recently signed a scholarship letter to continue her academic and softball careers at the University of South Carolina-Aiken. USC-Aiken, a Division II program, plays in the Peach Belt Conference. Pictured with Smith is North Harford athletic director Tim Larrimore (left), North Harford softball coach Barb Matthews and North Harford principal Colin Carr. Feb. 14, 2019 -- Bel Air senior defensive end Davon Bomar recently signed a scholarship letter to continue his academic and football careers at Coastal Carolina University. Bomar was a two-year letter winner for the Bobcats, earning All-UCBAC Chesapeake first-team honors in 2017. The Chanticleers play in the Sun Belt Conference. Feb. 13, 2019 -- Boys’ Latin senior wide receiver Nick Lizana recently committed to continue his academic and football careers at Bucknell University. Lizana was a three-year letter winner in both football and lacrosse and over the last three seasons he has led the Lakers in receptions, receiving yards and receiving touchdowns. The Bison play in the Patriot League. 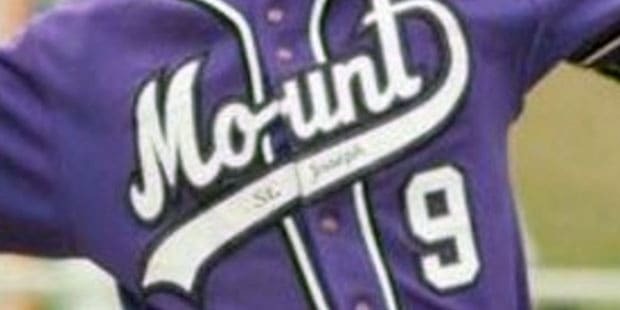 Feb. 6, 2019 -- A pair of Mount St. Joseph football players have signed National Letters of Intent to play Division 1 football at a pair of FCS schools. Gavin Pringle (left) signed with Bucknell University of the Patriot League and Maurice Nelson signed with Merrimack University of the North East Conference (NEC). Feb. 1, 2019 -- Perry Hall High has selected Luke Ethington as its new football coach. Ethington replaces Keith Robinson, who stepped down Jan. 23 after 11 seasons at the Baltimore County school and 17 overall. Ethington went 42-14 from 2008 to 2013 at McDonough in Southern Maryland, winning the Class 2A state title in 2010. He also served as assistant at Gallaudet University. Jan. 31, 2019 -- It was announced earlier this week that Arundel girls basketball head coach Lee Rogers has been selected to be the head coach of the West Team in the 2019 McDonald’s Girls All-American Game, to played March 27th in Atlanta, Georgia. Rogers, who is in his 30th season with the Wildcats and has led the program to four Maryland state championships and won 534 career games, more than any other girls basketball coach in Anne Arundel County history. He will be joined in Atlanta with by his Arundel staff. Jan. 29, 2019 -- Representing! Former Mount St. Joseph football player Kyle Fuller, now an All-Pro corner back with the Chicago Bears showed off his Baltimore roots and high school pride, Sunday, wearing Mount St. Joseph decal on his helmet during his appearance in NFL Pro Bowl in Orlando. Fuller, who played his college football at Virginia Tech, was selected in the 1st round of the 2014 NFL Draft by the Bears. During his four-year career he has 240 tackles and 15 interceptions, including a career best seven in 2018. Those seven interceptions tied him for the most in the league this year. He also intercepted a pass from Andrew Luck of the Indianapolis Colts in Sunday's Pro Bowl. Jan. 28, 2019 -- Calvert Hall’s Owen Johnson, the 2018 MIAA individual cross country champion, won the two mile race at the Ocean Breeze Indoor Track Invitational, held at the Ocean Breeze Athletic Complex in Staten Island, New York on Saturday. Johnson set a new personal best with a time of 9:20.93. The video below shows the exciting final lap in which Johnson lost a big lead, but held off his challenger over the final 100 meters to capture the victory. Calvert Hall’s Jason Holmes-Williamson also won at the event, taking the 55 meter hurdles, while Ty Trinh finished third in the triple jump and eighth in the long jump. Jan. 28, 2019 -- On Wednesday, Jan. 30th, Loyola Blakefield will hold its 6th annual Coaches Against Cancer fundraiser event. The day will feature a triple-header of MIAA A Conference basketball games as the Dons will host Gilman on the fresh-soph, junior varsity and varsity levels, beginning with the freshman game at 3:30 p.m. As in past years, a Wall of Honor will be established in the gym where students, fans and players can place a Wall of Honor card on which they write the name of a cancer survivor or of a loved one who fell victim to the disease. Donations will also be accepted to be donated to various cancer-related charities. Over the last five years the event has raised $15,000 for this important mission. Jan. 24, 2019 -- Old Mill basketball player Daevone Johnson scored 22 points in Wednesday's 73-55 Anne Arundel County boys basketball victory over South River and surpassed 1,000 career points during his career with the Patriots. Johnson also added 10 assists in the victory. Jan. 23, 2019 -- Former Reservoir High baseball player Jack Berry has been named honorable mention preseason All-American by D3baseball.com. 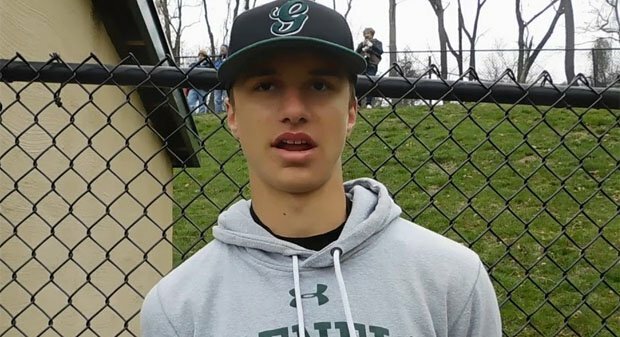 Barry, who will be a senior third-baseman at Salisbury University this spring, hit .413 in 2018 with eight home runs, 13 doubles, 57 runs scored and 50 RBI’s in just 180 at bats. Jan. 23, 2019 -- Westminster senior boys basketball player Drue Giles, with a pair of a free throws early in the Owls’ 62-57 Tuesday evening victory at Francis Scott Key, reached the 1,000 career point total. He would go on to finish with 14 points in the game and now has 1,012 career points. Jan. 22, 2019 -- St. John’s Catholic Prep junior girls basketball player Anna LeMaster surpassed 1,000 career points last week during her team’s 52-51 loss to IND. The Vikings play in the IAAM A Conference and are currently 9-7 on the season. Jan. 10, 2019 -- Westminster’s Matt Study has joined a growing list of area head football coaches who have announced they are stepping down since the conclusion of the 2018 season. Study, who played his high school ball for the Owls, had spent the previous 12 seasons with his alma mater and the last four as head coach, but is stepping away to devote more time to his sons, now ages 12 and 8. Impacting the decision was the recent death (November) of his father Richard, who passed away suddenly at the age of 62. He was 27-12 as the team’s head coach. Jan. 9, 2019 -- Dundalk High senior Michael Johnson became the 6th player in school history to score at least 1,000 career points on Wednesday night when the Owls defeated Carver A&T. A 5-foot-11 shooting guard who maintains over a 3.0 GPA and is enrolled in Dundalk's Homeland Security Program. Johnson is also taking Criminal Justice classes at CCBC-Dundalk. 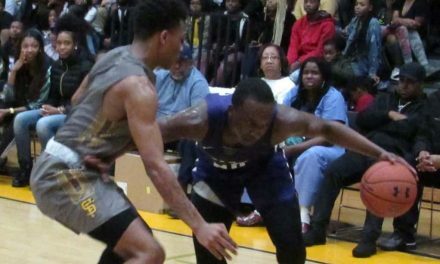 Jan 4, 2019 — St. Frances Academy will host its annual Baltimore Hoops Festival on Saturday, Jan. 5th with a full slate of boys’ high school basketball action featuring top shelf squads from 10:00 a.m. until late into the evening. The schedule is as follows Edmondson vs. Gerstell Academy, 10:00 am; City vs. McDonogh, 11:45 am; Boys’ Latin vs. Admiral Farragut (FL), 1:30 pm; St. Maria Goretti vs. Hill School (PA), 3:15 pm; Milford Mill vs. Mervo, 5:00 pm; Calvert Hall vs. Patterson, 7:00 pm; and St. Frances vs. Wilson (DC), 9:00 pm. Jan. 2, 2019 — Michael Harrison announced last month that he was stepping down as head football coach at Wilde Lake High School. Harrison had led the Wildecats for the last 10 seasons and led them to a 3A state championship in 2010. His overall record was just 52-53, but he did lead Wilde Lake to the state playoffs three times, winning four games and losing just two in the post-season. Harrison, who was also part of the staff at Wilde Lake led by coaching legend Doug DuVall, who won five state crowns with the Wildecats. Harrison is the second high profile Howard County football coach to step down since the season’s end. Butch Schaeffer who guided Glenelg to its first ever appearance in the state finals last fall, also announced he was stepping down after 13 seasons with the Gladiators. Dec. 21, 2018 – The College of Holy Cross (MA) football program was counting its blessings this week when 6-foot-8, 310-pound offensive lineman Ben Blessing of John Carroll School signed his National Letter of Intent to continue his academic and football career with Crusaders. Holy Cross is a member of the Patriot League. Dec. 19, 2018 – Continuing in the recent tradition of Archbishop Spalding quarterbacks, the Cavaliers' Jayden Umbarger affirmed his commitment, on Wednesday, to continue his academic and football career at the U.S. Naval Academy. Athletes do not sign traditional National Letters of Intent for Service Academies, but the players are still able to celebrate their choices with "signing ceremonies," which Umbarger did. In recent years, Spalding quarterbacks Zach Abey and Evan Fochtman also went on to play for the Midshipmen. Dec. 19, 2018 – On National Signing Day, a pair of Edgwood football players inked National Letters of Intent, as Daviyon Johnson signed with Monmouth University (NJ) and Deonte Banks signed with the University of Maryland. Pictured at the signing ceremony are (back row, left to right) John Siemsen (former Head Coach and current AP), Sarah Friedman (AD), Ken Ewers (Coach), Antwain Banks (Cousin), Darren Hill (Coach), Lavar Banks (Brother), Kilo Mack (Principal); (front row, left to right) Kelisha Johnson (Mother), Daviyon Johnson, Jamal Banks (Father), Deonte Banks, Laura Banks (Mother). Dec. 18, 2018 -- Glenelg head football coach Butch Schaffer, who recently announced he is stepping down from the program after 13 seasons, has been named the 2018 Baltimore Ravens High School Coach of the Year. Schaffer guided the Gladiators to a 13-1 record in 2018 and an appearance in the 2A State Championship Game, where they fell to Oakdale. It was the first time in the 60-year history of Glenelg that school appeared in a football state championship game. Dec. 17, 2018 - The Greater Baltimore Lacrosse Foundation (formerly the US Lacrosse Greater Baltimore Chapter) will have its Class of 2019 Hall of Fame Induction Ceremony on Saturday, Jan. 19, 2019 at Martin's Valley Mansion in Cockeysville. This year's class includes Joseph L. Fowlkes II, Joanna Lignelli, Kevin Mahon, Jessica Morgan, Mary Kay Parme, Jacqueline Seboda Pfeiler, Wick Sollers, Mitchell Whiteley and Gail Decker-Wittman. Tickets to the even at $95 per guest and include a Grand Supper Reception, including hors d'oeuvres, Open Bar and the Ceremony. Black Tie optional. Tickets can be ordered online through Jan. 11, 2019 at https://tshq.bluesombrero.com/gblaxfoundation or for more information contact greaterbaltlaxfoundation@gmail.com. Dec. 14, 2018 – The River Hill boys' basketball team defeated Marriotts Ridge, 49-42, in Howard County action on Friday night, delivering the 200th career victory for River Hill head coach Matt Graves. The team celebrated by presenting him with a commemorative basketball. Dec. 14, 2018 – Maddy Evans of Indian Creek became only the second Eagles' girls basketball player to ever surpass 1,000 career points. She achieved the milestone during the Indian Creek's Friday night IAAM C Conference game with Catholic High. Dec. 10, 2018 – St. Vincent Pallotti graduate Jaret Patterson, a freshman running back at the University of Buffalo football team was named the Mid-American Conference (MAC) Freshman of Year for the 2018 season. Buffalo, which lost in the MAC Championship Game, 30-29, to Northern Illinois, will play in the Dollar General Bowl on Dec. 22nd in Mobile, Alabama against Troy University. Patterson has rushed for 994 yards thus far this fall in 13 games, averaging 5.6 yards per carry and scoring 13 touchdowns. His twin brother James Patterson, also a Pallotti grad, is starting linebacker for Buffalo. He is second on the team in tackles with 70. He has one tackle for loss, one sack, three forced fumbles and one fumble recovered. Dec. 10, 2018 - Recent Mount St. Joseph soccer grad Brett St. Martin, an All-MIAA and All-State performer for the Gaels was key member of the 2018 University Maryland Men's Soccer Team, which captured the 2018 NCAA Division I National Championship, Sunday evening, with a 1-0 victory over Akron in the title game of College Cup in Santa Barbara, CA. St. Martin made seven starts and played nearly 800 minutes in his freshman campaign for the Terps. Dec. 4, 2018 — Four North Harford Senior Athletes recently signed National Letters of Intent. Seated in the photo (left to right) Julia Barstow (Millersville Lacrosse), Brooke Ciampaglio (Delaware Lacrosse), Anna Racine (New Haven Field Hockey) and Kaleigh Sasdelli (Millersville Lacrosse). Standing (left to right) Tim Larrimore (Athletic Director), Carla Harward (Head Field Hockey Coach), Patty Murdy (Head Lacrosse Coach) and Colin Carr (Principal). Nov. 21, 2018 – Ben Pika, a senior pitcher on the John Carroll baseball team, who will play his final high school season in the spring, has signed a National Letter of Intent to continue his baseball and academic career at Washington College in Chestertown. 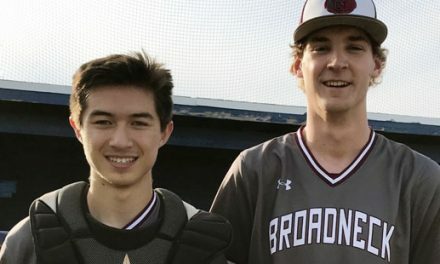 Pika, a 6-foot-3, 180-pound right-hander, was a key ingredient in the Patriots bullpen in a season where they started 17-0 and spent several weeks as the area's top-ranked team. He pitched in middle relief and closed many games. Nov. 15, 2018 — Franklin High senior girls basketball player Dominque Doss signed a National Letter of Intent to continue her academic and athletic career at Canisius College Wednesday morning. A two-time consensus All-Baltimore County pick, Doss selected the New York school over Austin Peay, Buffalo and Coppin State. Peay averaged 20.8 points, 8 rebounds, 4 assists and 3 steals as a junior last season. Peay has scored 1,094 points in her varsity career. Nov. 8, 2018 - Coach Corey Baker and the captains from his City College Black Knights display the 3A South Region Soccer Championship plaque after their 1-0 win over Huntingtown in the 3A South final. The Black Knights (14-1-2) have advanced further than any City College soccer team has in more than 25 years. 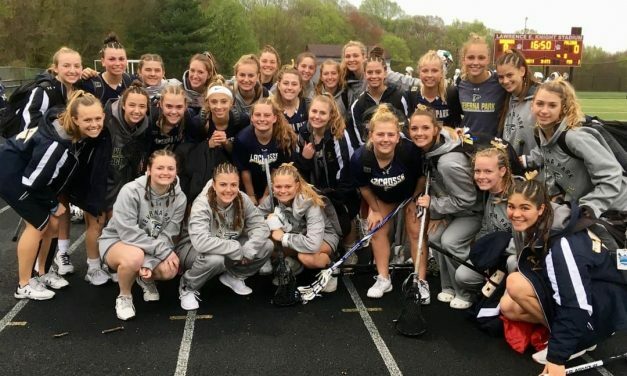 The Knights will now face reigning 3A state champion C. Milton Wright in the 3A State Semifinals on Saturday (5:00 p.m.) at Linganore High School in Frederick. 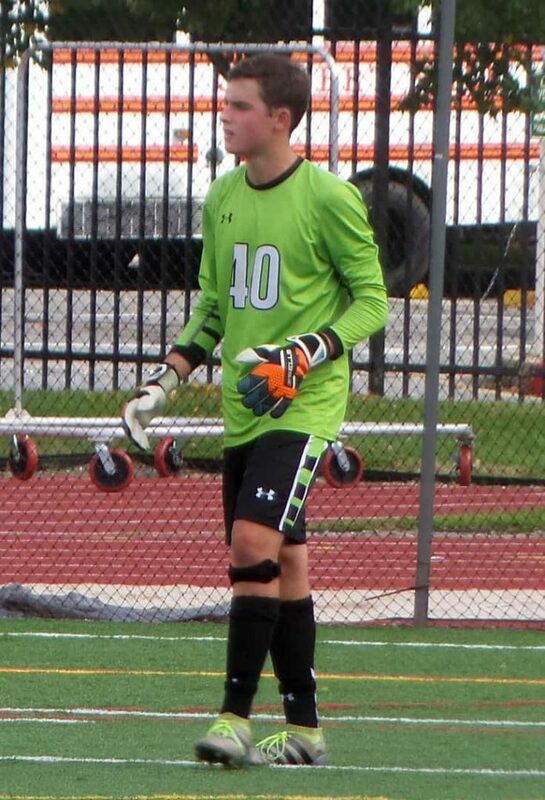 Nov. 2, 2018 -- Calvert Hall senior goalkeeper Spencer Nattans has committed to accept a scholarship to play Division I college soccer at Loyola University in Maryland. Nattans, a two year starter for the Cardinals, was also a member of the school's 2016 MIAA A Conference championship team. Oct. 19, 2018 — Broadneck girls soccer player Makenna Dean scored her 50th goal of her high school career, Thursday, in the Bruins’ 5-0 win over Meade. It was her 13th goal of the 2018 season. Oct. 18, 2018 — Archbishop Spalding softball coach Nicki Trumpler, once a standout player with the Cavaliers, has announced she will step down as the team’s head coach. 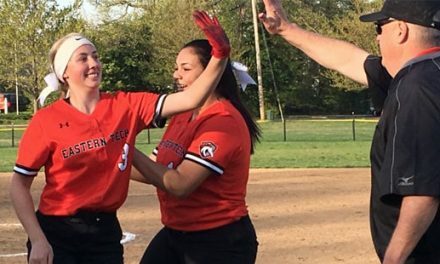 She won four IAAM A Conference titles in two different stints as softball head coach and led the team to last year’s league final. Trumpler made the decision to focus more on her duties as a Religious Studies teacher at Spalding. Oct. 18, 2018 — With its 8-1 rout of Franklin on Wednesday, the Towson boys soccer team clinched first place in Baltimore County’s Division I North/West and a spot in the Baltimore County Championship Game, opposite Division I East/South winner Eastern Tech. The Generals and Mavericks, in a rematch of last year’s title game, will meet on Oct. 23rd (5:00 pm) at CCBC-Catonsville. The Girls Championship, featuring Sparrows Point and Perry Hall, will follow at 7:00 p.m.
Oct. 16, 2018 -- Ben Cook recorded a shutout and Ethan Lassen had two goals and two assists to the lead the offense for the No. 20 Bel Air boys soccer team as the Bobcats closed their regular season with a 6-0 UCBAC Chesapeake Division win over Aberdeen. Oct. 16, 2018 — Kerrigan Clem had 14 kills, four aces and four blocks as she led Harford Tech to a 3-1 UCBAC volleyball victory over North Harford, 22-25, 25-13,25-23, 26-24. Caitlyn Bobb added eight kills and two aces, Laura McCall had 14 assists, three aces and one kill and Jen McMillion and Victoria Westerman combined for five kills, two aces, one kill and two blocks. Oct. 13, 2018 — No. 10 Archbishop Curley soccer took a break from the rigors of the MIAA A Conference to battle St. Augustine Prep (NJ) on Saturday morning at Curley and the Friars prevailed, 3-0. Brandon Holy, Bryce Woodward, and Anthony Dragisics each scored a goal for Curley. Oct. 12, 2018 — Rachel Fleig netted a hat-trick and Hannah McKeon scored once as No. 5 Chesapeake-AA defeated Annapolis, 4-1, in Anne Arundel County field hockey action. Flieg also had an assist and Lee Evans had two for the Cougars. Avery Anderson scored the lone goal for Annapolis. Oct. 12, 2018 — Josh Ehrlich threw six touchdown passes while completing 16-of-21 throws for 303 yards to lead No. 3 Broadneck to 48-30 Anne Arundel County football victory over host South River. Andrew Woods, Jr. caught six balls for 162 yards and two scores, while Ethon Williams also had six grabs, for 96 yards, and three scores. Tnaejah Watts also had a TD catch for the undefeated Bruins. Oct. 12, 2018 — Ava Swartz scored on a penalty kick and assisted on a goal by Jaclyn Marszal as Glenelg Country topped Bryn Mawr, 2-0 in an IAAM non-league girls soccer match in Ellicott City. The Dragons Brianna Chun earned the shutout with 12 saves. Both goals were scored in the first half. Oct. 12, 2018 - For the second time this month a former Loyola Blakefield basketball player has made a Division I men's program as a walk-on. Will Clark, a 2016 graduate of Loyola, who played three years of varsity basketball, has made the roster at the University of Maryland. Last week, VSN reported that former Don Andrew Fava made the roster at the University of Florida. Clark played club basketball at Maryland last year before attempting the walk-on this fall. Recently, his younger brother Samuel, also a Loyola student, committed to play Division I volleyball at Ohio State. 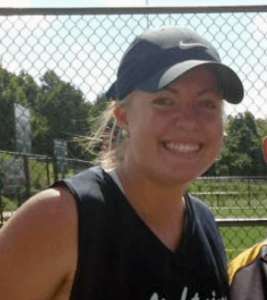 Oct. 5, 2018 — John Carroll graduate Alexa Martinez, a sophomore tennis player at Towson University, placed second in her draw last weekend in the St. Joseph (PA) Invitational. As a freshman, Martinez finished the dual meet season at 8-4 in singles and also went 4-2 in doubles competition. Oct. 5, 2018 — Andrew Fava, a 2016 graduate of Loyola Blakefield, has made the University of Florida men’s basketball team as walk-on for a second consecutive year. Fava, a junior, served as a team manager as freshman before making the squad last year, appearing in seven games and scored six points. Sept. 29, 2018 - No. 10 Westminster had its home football game with Francis Scott Key postponed until Saturday because of slick field conditions. It will be played a 7:00 p.m. at Glenelg in Howard County. In addition, Parkville moved its Baltimore County home game with No. 5 Milford Mill to the turf at Dundalk (1:00 pm), the Winters Mill at South Carroll game was shifted to Saturday at 6:00 p.m.
Sept. 28, 2018 - The second annual Joshua Hamer Memorial Tournament will take place Sept. 29-30, followed by a Home Run Derby, on Oct. 6-7, at John Carroll School. The event, in honor of Josh Hamer, a JC baseball player who was killed in an automobile accident in March of 2017. The event raises funds for the Josh Hamer Memorial Scholarship, which assists young baseball players interested in attending John Carroll. For more information about the event, including schedules and entry information, visit www.joshhamerscholarship.org. Sept. 5, 2018 - Former Mount St. Joseph basketball player Jaden Robinson, who attended Suffield Academy (CT) prep school last year, has joined the Georgetown University men’s basketball team as a walk-on for the 2018-19 season. Robinson, who is 6-foot-5, was a key performer on MSJ’s 2016-2017 squad that won both the MIAA A Conference and Baltimore Catholic League championships and ended the year as No. 1 in the VSN Top 20. Last winter at Suffield, he was named All-NEPSAC Class A as he led his team in scoring (12.9 per game), steals (1.4 per game), free throw percentage and free throws made. Sept. 3, 2018 - Cyrus Jones, a one time football star at Gilman School, has been signed to the practice squad of his hometown Baltimore Ravens. After leaving Gilman, Jones went on to win a national championship as a defensive back and kick returner at the University of Alabama. The New England Patriots made him a second-round pick in 2016 and he was member of the New England squad which defeated the Atlanta Falcons in Super Bowl LI. Jones tore his ACL during training camp in 2017 and spent last season on Injured Reserve before being cut this week by the Patriots. As a member of the Ravens’ practice squad, Jones will be allowed to recover further from his knee injury while providing some insurance for the team’s return game, where the job has been awarded to undrafted rookie free agent Anthony Averett, also from Alabama. In 2016, Jones returned eight kickoffs for 225 yards and 11 punts for 46 yards and struggled with five fumbles. Aug. 30, 2018 - Former Baltimore Raven and River Hill alum Michael Campanaro continues to have trouble keeping his NFL career on track. Coming out of Wake Forest, Campanaro was hailed as a potential star as a slot receiver, in the mold of former New England Patriots' great Wes Welker. When on the field, he showed flashes of such potential, but unfortunately, during his four-year career with the Ravens, Campanaro spent more time injured than he did on the field, missing 40-of-64 possible games. Signed this offseason as a free agent with Carolina Panthers, his 2018 season is already complete, as he was recently placed on injured reserve with and undisclosed injury. In Baltimore, Campanaro appeared in 24 games, making 31 receptions for 310 yards and two touchdowns. He also returned 37 punts for 420 yards and one touchdown. July 24, 2018 - Teams are still be accepted for the 2018 DTLR JV Basketball Showcase hosted by Archbishop Curley High School, December 28-30. The registration fee is $90 if you wish to participate one day (one game) and $180 for two days (two games). Fee covers expenses for referees. If interested, please contact Scott Bowden at 443-829-8657 (mobile) or 410-485-5000, ext. 281 (work), or email at jbowden@archbishopcurley.org. 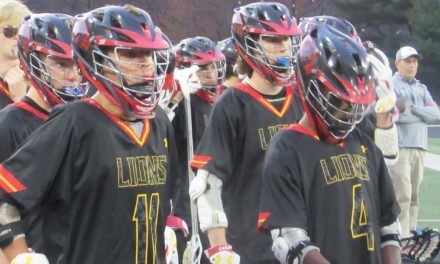 Current teams that have committed include St. Vincent Pallotti, Calvert Hall, Mount St Joseph, Aberdeen, Poly, Digital Harbor, Douglass, Parkville, St. Frances, Boys’ Latin, AACS, Gilman, NAF, Pikesville, Concordia Prep, City, Green Street Academy, Overlea, Cristo Rey, South River, and Reginald Lewis. July 4, 2018 - Archbishop Curley rising senior shortstop Tyler Locklear has been selected to play in the 2018 Under Armour All-American Baseball Game on July 20th Wrigley Field in Chicago. Locklear, a key member of Curley’s 2018 MIAA A Conference championship team, which finished No. 1 in the final VSN Baseball Top 20, batted .355 and hit 10 home runs for the Friars in the spring. He also belted seven doubles, scored 39 runs and drove in 35. In addition, was hit by pitch 13 times and drew 16 walks, producing an on base percentage of .504. After completing his final year with Curley, Locklear is committed to play his college baseball at Virginia Commonwealth University. July 2, 2018 - Andre Carr of St. Frances Academy has signed a track scholarship with Indiana University of Pennsylvania (IUP). Carr, who tore his ACL late last summer practicing with the varsity football team, is the first St. Frances track performer to earn a scholarship. He won the MIAA B Conference 100-meters outdoor title in 2018 and 2017, and claimed the 200 title this past spring. June 25, 2018 - Jalen Morant of Chapelgate Christian has committed to play college basketball for Division 3 Wilson College (PA). 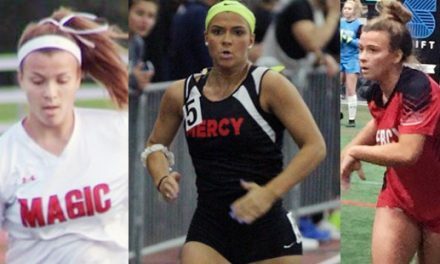 Wilson competes in the North Eastern Athletic Conference (NEAC) where it finished 20-8 last year. Morant averaged 8.0 points per game as a senior and had 51 three-pointers made this season to lead the Yellow Jackets. June 25, 2018 - Patrick Eby, a senior long-snapper at Columbia University who played his high school football at Loyola Blakefield, has been named a 2018 Preseason All-American in the Football Championship Series (FCS) division of college football by HERO Sports. Eby has seen action 30 games as long-snapper over three seasons. He has snapped 194 punts, 60 point after attempts and 40 field goals for the Lions. A Psychology major, Eby has also registered four career tackles on special teams coverage. He also played a key role in Columbia ranking among national leaders in both punt return defense (No. 4 at 3.33) and net punting (No. 13 at 38.59). 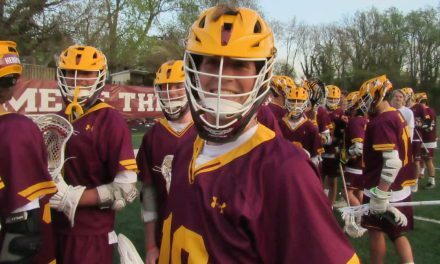 He was a three year varsity starter at Loyola and, as a senior, he was rated the nation’s No. 4 long-snapper by the 2014 Kohl’s National Scholarship Camp. He also played lacrosse and the through the shot put and discus in track. June 19, 2018 - Avery Williams, a graduate of Archbishop Curley and Temple University, has survived final cuts with the Ottawa Redblacks of the Canadian Football League and will make his professional debut on Thursday night when the Redblacks play the Saskatchewan Roughriders in their season opener. In a pair of preseason games, Williams, a linebacker, made seven tackles, four on defense and three on special teams. He also had one fumble recovery. Williams signed with the Houston Texans as free agent in 2017 after a brilliant college career at Temple and made it all the way through training camp before being cut on Sept. 2nd. June 11, 2018 - South Carolina red-shirt sophomore pitcher Cody Morris, a graduate of Howard County's Reservoir School who was drafted by the Cleveland Indians in the 7th round of last week's MLB First-Year Player Draft, won his ninth game of the season for the Gamecocks, Sunday evening, defeating 5th-ranked Arkansas in the NCAA Baseball Super Regionals, evening that best of three series at 1-1. In the game, nationally televised by ESPN, Morris pitched five innings of four-hit baseball, with four strike outs and one walk. South Carolina and Arkansas will play again Monday night with the winner gaining a spot in the NCAA College Baseball World Series in Omaha, Nebraska. June 4, 2018 - Last month Brandon Wise of Chapelgate Christian Academy committed to play college basketball at Waynesburg University (PA), a NCAA Division 3 program. Wise led Chapelgate by shooting 48% from the field, while averaging 9 points, 2.5 rebounds and 1.3 rebounds per game. May 14, 2018 - Last week, five members of the Western High basketball team, all members of the Class of 2018, were celebrated for making their college commitments to continue their education and play college basketball. Pictured (from left to right) are Makenzie Pollard (St. Francis University), Makayla Pickens (Salem University), Assistant coach Mike Townsend, head coach Tasha Townsend, Destiny Johnson (Thiel College), Cache Waters (Baltimore City Community College) and Jasmen Walton (North Carolina A&T). April 24, 2018 - Noah Locke of McDonogh School, who will play his college basketball at the University of Florida and VSN Boys' Basketball Player of the Year Jalen Smith of Mount St. Joseph, bound for the University of Maryland, will be on the United States roster in tonight's 45th annual Capital Classic High School All-Star Game in Washington, DC. Smith and Locke will join notable alumni of the game which include Michael Jordan, Magic Johnson, Mosses Malone, Ralph Sampson, Patrick Ewing, Camelo Anthony and many, many more. Tipoff is at 8:00 p.m. at Catholic University. April 16, 2018 - St. Paul’s junior wrestler Kurt McHenry, a two-time Cadet World Champion and one of the nation’s most prized recruits in the class of 2019, has announced that he will wrestle collegiately at the University of Michigan. McHenry, a 125-pounder, considered North Carolina, Penn State, Stanford and Cornell before making his choice. April 12, 2018 - On Wednesday, four Dulaney student athletes signed National Letters of Intent to continue their athletic and academic careers. Signing were field hockey player Reece Spann, with the University of Maryland, boys' lacrosse player Aaron Dow, with Wilmington University, and track & field athletes James Green, with Rider University, and Destiny Clinton, with West Virginia Tech University. April 12, 2018 - Erik Washington, the 1991 Maryland State Soccer Player of the Year while at Meade High School who would go on to a Hall of Fame college career at Towson University and a professional career with the Baltimore Blast and Tampa Bay Terror, has been named the new head soccer coach at St. Paul's School. Washington also spent five years as Assistant Head Coach at Towson University, served as a player/coach with the Chesapeake Dragons in the United Soccer League's Premier Development League, and coached boys in the Maryland Olympic Development Program. April 11, 2018 - Two Boys' Latin senior lacrosse players signed National Letters of Intent this week, as Mason Russell will play at Division II University of Alabama Huntsville and Jack Morton will play Division I lacrosse at UMBC. Both players were honored in a special signing ceremony at the school. March 29, 2018 - Mount St. Joseph basketball coach Pat Clatchey will serve as one of the assistant coaches at the 17th annual Jordan Brand Classic to be held April8th at the Barclays Center in Brooklyn, NY. In the event, Clatchey will coach St. Joe star Jalen Smith one final time. Smith will appear following a impressive performance this week in the McDonald’s All-American game in Atlanta. In previous years, NBA superstars such as Carmelo Anthony, Kevin Durant, Blake Griffin, LeBron James and Chris Paul have played in this game. March 22, 2018 - Still dancing. The NCAA Tournament is down to the Sweet 16 and Baltimore area players are continuing to take the dance floor as no less than four former local prep stars continue to chase the dream of a college basketball national championship. The group includes Kamau Stokes (City College/Kansas State), Phil Booth (Mount St. Joseph/Villanova), Daxter Miles (Dunbar/West Virginia) and Denny Grace (Calvert Hall/Villanova). March 20, 2018 - Former Gilman football standout Brandon Copeland, who briefly played with his hometown Baltimore Ravens, has signed a free agent contract with the New York Jets. Copeland, a linebacker who spent the last three years in the Detroit Lions' organization, missed the entire 2017 season with a torn pectoral muscle. He played his college football at Penn and was signed by the Ravens as an undrafted free agent in 2013. He later played for the Tennessee Titans and was set to play the 2015 season in the Arena Football League before being signed by Detroit. March 20, 2018 - Former Hereford football player Andrew DePaola, who had to earn a spot on the Rutgers University football team as a walk-on long snapper, became the highest paid long snapper in the NFL last week when he signed a four-year $4.72 million deal with the Oakland Raiders. DePaola ranked seventh in snap accuracy (97.7%), last season with the Chicago Bears, among 33 NFL long snappers that were graded by Pro Football Focus. After college, DePaola had a hard time hooking on with a NFL team, working for four years at Best Buy, before Tampa Bay gave him an opportunity in 2014. He spent three seasons with the Bucs before moving to Chicago last fall. March 20, 2018 - St. Frances girls basketball star Nia Clouden has been named the Gatorade Maryland Girls Basketball Player of the Year for a second straight year. Clouden has been a key component of three straight IAAM A Conference titles for the Panthers, who posted a 24-4 record in 2017-18. She averaged 13.8 points, 3.1 assists, 1.2 steals and 3.1 rebounds. Cloudan will play at Michigan State University next year. March 18, 2018 - After missing all of last season to recover from Tommy John Surgery, former Archbishop Spalding pitching ace Jordan Carr is healthy and off to solid start in 2018 as a red-shirt sophomore at Division I UNC Ashville. The lefty and former VSN Pitcher of the Year is 2-2 with a 4.56 ERA in 25.2 innings with 17 strikeouts. Carr defeated Lipscomb in his season debut and earned a no decision in a start against Mercer. He also pitched 5.1 solid innings in a 4-2 loss to ACC power Florida State before bouncing back for a seven-inning outing against Manhattan, earning a 9-3 win. March 9, 2018 - For the second consecutive year Mount St. Joseph basketball player Jalen Smith has been named the Gatorade Player of the Year for Maryland. 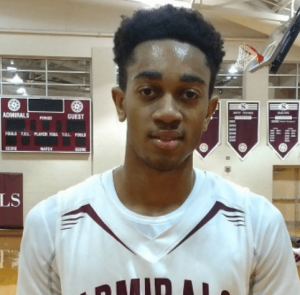 Smith also repeated this year as the Baltimore Catholic League Player of the Year and is the odds on favorite to repeat as the VSN Player of the Year. Smith, who will play in the McDonald's All-American Game later this month will play his final high school game with St. Joe on Saturday as the Gaels conclude their three-day run at the Alhambra Catholic Invitational in Frostburg against St. Maria Goretti. March 8, 2018 - Sydney Frank, a three-sport scholar athlete at C. Milton Wright recently signed a National Letter of Intent to play women’s lacrosse at Villanova University. Frank, who will be competing with the CMW girls basketball team in the 3A state semifinals this weekend, carries a 4.5 GPA and is a co-captain on the Mustangs’ soccer, basketball and lacrosse teams. 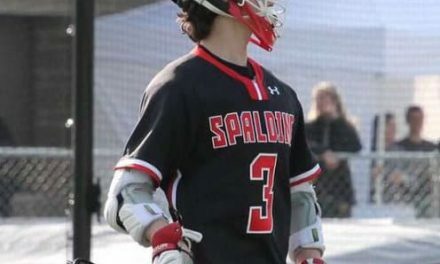 March 7, 2018 - Boys’ Latin graduate Anthony Wyler, a junior at the Coast Guard Academy, scored the with 32 seconds left in the first overtime, Tuesday, to lift the undefeated guard to a 10-9 win over Wesleyan College (CT). The score completed a hat-trick for Wyler. 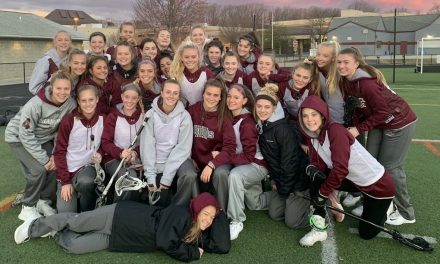 Sophomore teammate Riley McNulty, a graduate of Broadneck, also had a hat-trick in the win, including two fourth period goals that helped create the overtime. March 6, 2018 - St. Frances and Mount St. Joseph will represent the Baltimore Catholic League, along with St. Maria Goretti out of Hagerstown at the 56th annual Alhambra Catholic Invitation Tournament which gets underway at Frostburg State University on Thursday. In the opening round, BCL champion St. Frances will face Bishop O’Connell of the WCAC. St. Joe will battle Gonzaga and Goretti will face DeMatha. Both Gonzaga and DeMatha are also in the WCAC. The tournament continues Friday and Saturday with Semifinals, Consolations and the Championship Game. 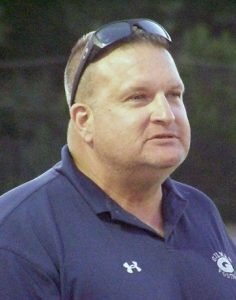 Feb. 7, 2018 - Ken Kraus, who had served as the defensive coordinator on the staff of recently retired South Carroll head football coach Steve Luette for the last 11 years, has been named to succeed his former boss as the new head coach of the Cavaliers. Kraus served as an assistant at South Carroll from 2001-2006 and then left the program for three seasons while he was coaching the Carroll County Cannons semipro team. He rejoined Luette’s staff in 2009. Jan. 19, 2018 - Gettersburg College senior women’s basketball player Emily Gibbons, a graduate of Severn School, scored 24 points in the final three quarters of her team’s Centennial Conference game at McDaniel College, on Wednesday, leading the Bullets to a 66-53 win, in Westminster. Gibbons has had a stellar career at Gettysburg, winning the Centennial Conference Rookie of the Year award as a freshman, being named an Honorable Mention All-Centennial Conference pick as a sophomore and then being named the Centennial Conference Player of the Year, as well as 1st-Team All-Conference, 1st-Team All-Mid-Atlantic, and Honorable Mention D3hoops.com All-American, as a junior. Jan. 19, 2018 - The National Federation of High Schools (NFHS) has named Patterson Mill girls soccer coach Mike Parker as its Mideast Sectional Coach of the Year. Parker has led Patterson Mill to three consecutive appearances in the 1A state championship game. All three ended in defeat to perennial power Sparrows Point. He has posted a record of 89-64-8 in 10 seasons with the Huskies. Jan. 18, 2018 - Earlier this month, South Carroll football coach Steve Luette announced he is stepping down as the Cavaliers head coach after 32 seasons. He said the decision would allow him more time to pursue outside business interests and to be with his family, as he learned during the Christmas break that he would become a grandfather next summer. Luette thanked all of the administrators and coaches he was worked through the years, as well as of the players and families affiliated with the program. "I believe that football prepares players for life," said Luette. "My only hope is that all the players we have coached over the years will be successful in whatever they do." Jan. 9, 2018 - A couple former VSN Upper Weight Wrestlers of the Year, Myles Martin of McDonogh, our 2014-15 honoree, and Ethan Smith of Sparrows Point, our pick in 2016-17, are off to sensational starts this winter at Ohio State. Martin, who shocked the world in winning an NCAA National Championship as a freshman and has been an All-American in each of his first two college campaigns is 40-0 in this season while wrestling at 184. Gaining valuable experience as Martin’s understudy is Smith, who is 12-4 in limited action, also at 184. Jan. 7, 2018 - Annapolis High School will dedicate the school’s basketball court in honor of long-time boys’ basketball coach John Brady on Jan. 23rd. Brady stepped down as Annapolis head coach with 772 career wins, more than any other boys’ public school basketball coach in state history. Brady had a career record of 772-173, a winning percentage of .816. Brady currently serves as an assistant coach at Glen Burnie High School and the ceremony will take place prior to the Panthers’ varsity game against Glen Burnie that evening. Jan. 6, 2018 - Shepherd College (WV) junior wide receiver Ryan Feiss, who played his high school football at North Harford, was named to the 2nd Team of the 2017 D2CCA All-Super Region Team. Feiss led all Shepherd wide receivers with 95 catches for 1,391 yards and nine touchdowns. He ranked third in the nation in receiving yards and receptions per game (8.6), while ranking fourth in receiving yards per game (126.5). The Forest Hill, Md. native was also name 1st-Team All-Mid-Eastern Conference. Shepherd went 10-0 in 2017 and finished the regular season as the No. 2 team in the nation in the American Football Coaches Association Division II Coaches Poll. The Rams, however, were upset in the first round of the playoffs Findlay College and ended up at No. 12 in the final national ranking. Dec. 22, 2017 - At the Frostbite Invitational, Gilman senior Mason Freeman won the long jump with a leap of 23-feet-7, which is tied for the longest jump in the nation this season. The Greyhounds scored 92 teams points to win the team championship at the event. Dec. 21, 2017 - Southern wrestler Josh Merkle picked up his 100th career win with a 16-second pin as he helped lead the Bulldogs to a 46-26 non-league victory over Rising Sun. Dec. 1, 2017 - McDonogh School boys soccer coach Brandon Quaranta, who guided the Eagles to the MIAA A Conference championship this fall, has been appointed the new Director of Soccer Operations of FC Baltimore, a semi-professional men's team. Nov. 27, 2017 - Job Alert: C. Milton Wright is seeking applications for the positions of Assistant Varsity Baseball Coach and Assistant JV Baseball Coach for the 2017 spring season. Interest candidates should contact Coach Joe Stetka at joe.stetka@maryland.gov. Nov. 26, 2017 - More Deonte Harris. The 2014 VSN Football Offensive Player of the Year from Archbishop Curley and the 2017 NE10 Most Valuable Player for Assumption College literally willed the Greyhounds to victory, Saturday, in the second round the NCAA Division II playoffs, scoring four touchdowns, two receiving and two on kick returns. He had 362 All-Purpose yards in the contest. He has now scored 16 touchdowns this season, eight receiving, and NCAA DII record tying five punt return touchdowns and now three kickoff returns for touchdowns. Check out the highlights below. Nov. 22, 2017 - University of Maryland freshman basketball player Darryl Morsell, a star at Mount St. Joseph during his high school career, was named the Big 10 Freshman of the Week. Morsell averaged 14 points, 2 rebounds and 1.5 steals in Maryland victories over Butler and Bucknell. In the Bucknell victory he started the second half and was the catalyst as the Terps rallied from 15 points down, by scoring 12 second half points and playing lock down defense. Nov. 21, 2017 - Archbishop Curley graduate and 2014 VSN Football Offensive Player of the Year Deonte Harris was named the North East 10 Conference 2017 Football Most Valuable Player. Harris, a junior at Assumption College (MA) scored 12 touchdowns in 2017, six receiving and six on returns, including leading the nation with five scores on punt returns and tying the single season NCAA Division II record. He also tied a Division II record by returning punts for touchdowns in three consecutive games, despite the fact that opponents deliberately attempted not to kick to him. He finished with 47 catches for 567 yards and 1,457 all-purpose yards. Oct. 19, 2017 - Severn School senior basketball player LJ Owens has announced that he has accept a scholarship offer from William & Mary University. Owens, who averaged 22 points, 5.8 points and 2.1 assists last winter is considered one of the top players in the MIAA B Conference. 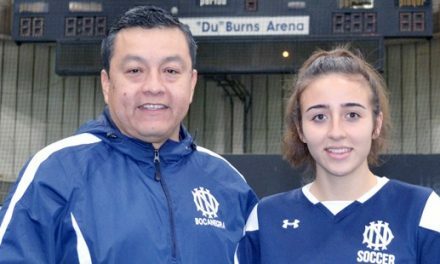 He had more than 20 scholarship offers and selected the Indians from a group of finalists which included Delaware, St. Joseph’s and Quinnipiac. Oct. 18, 2017 - No. 10 Archbishop Spalding took a 2-0 halftime lead and then held on for a 3-2 win over Bryn Mawr in IAAM A Conference field hockey action. Margot Lawn led the Cavaliers with 2 goals and Kristen O’Neill scored the other. Jillian Rocco and Ashley Feary scored for the Mawrtians. Oct. 18, 2017 - Jules Walter delivered 7 kills and Lexi Childress served 10 aces as C. Milton Wright defeated Fallston, 3-1, in UCBAC girls volleyball. Oct. 5, 2017 - Demolition got underway this week on the seating area and press box at St. Paul’s School’s Tullai Field, making way for a new and enlarged grandstand and press box, as well as locker rooms, team facilities, and viewing plazas at each end of the field. The facility is expected to be completed in time for the spring season. Oct. 3, 2017 - McDonogh School senior basketball star Noah Locke announced Tuesday night that he will play his college basketball at the University of Florida, during a Facebook Live video. Locke, who had narrowed his choices down to Michigan, Ohio State, Providence and Xavier, is rated the nation’s 66th over prospect in his class. Sept. 30, 2017 - Harford Tech football is now 5-0 in 2017. The undefeated Cobras celebrated their homecoming on Friday with a 45-0 rout of Capital Christian. Quarterback Ryan Hunt had a pair of touchdown passes, one each to Jordan Bright and Laday Cooper. Tech also rushed for two scores as Kyle Cicone and Jalen Dangerfield both reached the end zone. Sept. 29, 2017 - No. 7 C. Milton Wright became the first team to get a result against top-ranked Archbishop Curley in boys soccer, pushing the Friars to the limit in gaining a 2-2 double-overtime draw, on the road Friday at Curley. Sept. 28, 2017 - Jasmine Dickey, who averaged 23.8 points in helping the Catonsville girls basketball team win a 4A state championship last winter, has made a verbal commitment to play her college basketball at the University of Delaware. Dickey scored 23.8 points per game and nearly averaged a double-double with her 9.7 rebounds per contest. Drexel and Hartford were also final choices for the Comet senior. 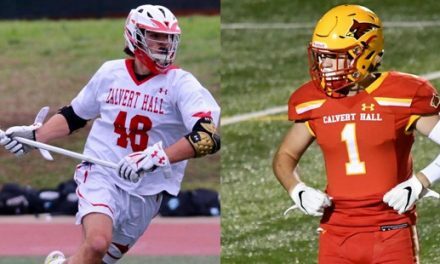 Sept. 25, 2017 - Brady O'Conner, a key component in Calvert Hall's run to the 2016 MIAA A Conference soccer championship and a freshman on the George Washington University soccer team, was named the Atlantic 10's Co-Rookie of the Week last week. He scored the lone goal in a 1-0 win over the New Jersey Institute of Technology and is now tied for the team lead with three goals, all of which have been game-winners. Sept. 25, 2017 - Chesapeake-AA field hockey completed its matches against Howard County A Tier opponents with a perfect 3-0 record, as the #4 Cougars defeated #11 River Hill, 2-0. Rachel Fleig and Bridgette Tayman scored the goals. Goalkeeper Eve Vickery, and defenders Logan Beal, Leah Evans, Riley Sullivan and Madison Hoyer keyed the shutout. Sept. 24, 2017 - John Carroll grad and 2015 VSN Football Offensive Player of the Year Keith Rawlings has Yale University off to a 2-0 start. In Week 1, Rawlings, a sophomore quarterback completed 20-of-26 for 308 yards and four touchdowns to lead a 56-28 rout of Lehigh. The performance earned him Ivy League Offensive Player of the Week honors. He was also College Football Performance honorable mention for National Performer of the Week. The following week he passed for one score and rushed for another in a 49-24 win over Cornell. 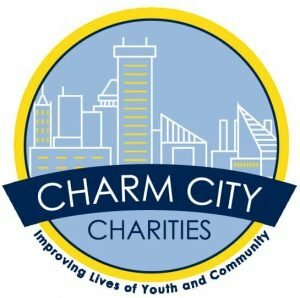 Sept. 20, 2017 - Charm City Charities will host a FREE Basketball Coaches Clinic on Sept. 23, from 8:30am-2:15pm, at Calvert Hall. The clinic is open to all area basketball coaches, but there is only room for 50 attendees. The event will feature 5 hours of instruction and demonstration, lunch and Q&A with the speakers. Scheduled to present are Mike Jones of DeMatha, Steve Wojciechowski of Marquette University, Herman Harried of Lake Clifton, Pete Strickland of the Irish National Team, Shawnta 'Nut' Rogers of Charm City Basketball, Pat Clatchey of Mount St. Joseph and Steve Turner of Gonzaga. The first 50 individuals to email bspotts@verizon.net can reserve a spot. Or, click here for details. 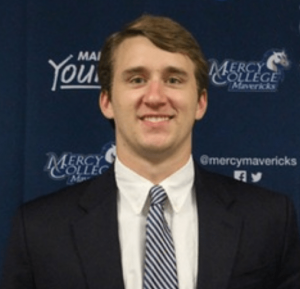 Sept. 14, 2017 - One time John Carroll boys basketball standout Mike Maczko has been named the new men's head basketball coach at Mercy College in Dobbs Ferry, NY. Maczko spent last season as an assistant at Post University and has also coached at Georgia Tech, and Johns Hopkins University. Click here to read more Maczko. 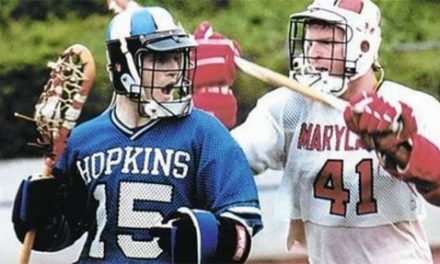 Sept. 14, 2017 - Gilman and Johns Hopkins alum Kevin Boland, Jr. has been named the new boys varsity lacrosse coach at Glenelg Country School. 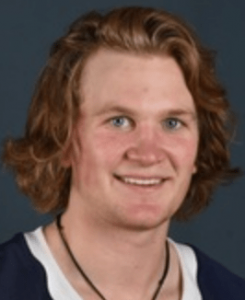 Bolland, who played professionally for several seasons in Major League Lacrosse (MLL) was an assistant coach with the Dragons in 2016. In addition, GCS announced the appointment of Brandon Ballard as the school’s new wrestling coach. Previously, Ballard has coached at North County High School in Anne Arundel County and South Dakota State University. Sept. 10, 2017 - The Francis Scott Key football team has scored 90 combined points in its first two games, in defeating North East-Cecil and Berkley Springs (WV) and the Eagles are 2-0 for the first time in 14 years. Friday night FSK will try to make it three in a row when it visits Patterson Mill in Hartford County. Sept. 8, 2017 - Baltimore Polytechnic senior star Demetrius Mims will head west to California at the conclusion of his high school basketball career, announcing his verbal commitment to play at Long Beach State, a Division I program in the Big West Conference. Mims averaged 14.9 points and 5.1 rebounds per game last year. Sept. 6, 2017 - St. Frances’ top-ranked football team is getting an unexpected bye this weekend, as the Panthers trip to Florida to play the nation’s No. 1 team, IMG Academy, has been postponed because of the pending landfall of Hurricane Irma in Florida. The storm has also caused the postponement or cancellation of sporting events throughout the Sunshine State, including the NFL season-opener between the Miami Dolphins and Tampa Bay Buccaneers. St. Frances and IMG are hoping to reschedule the contest at the end of the year. No. 2 Archbishop Spalding also cancelled its game in Florida with Bishop Moore. Sept. 3, 2017 - VSN joins the local high school sports community in mourning the loss of Sherwood athletic director Walter Hardy, who died suddenly on Saturday. 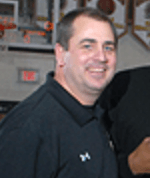 Hardy had spent the last two years as AD at John F. Kennedy High School, following a highly successful 17-year stint as the boys head basketball coach at Paint Branch High School, where his team won the 1999-2000 Maryland 3A state title. He was 50 years old. Sept. 3, 2017 - John Carroll grad Kurt Rawlings, the 2015 VSN Offensive Football Player of the Year, has been named the starting quarterback at Yale University, after winning the job during training camp. Rawlings, a sophomore, broke the Bulldog lineup late last fall, coming off the bench to throw a pair of touchdown passes against Colgate and then leading Yale to an upset win over rival Harvard. The Bulldogs open their season Sept. 16 at Lehigh. Aug. 30, 2017 - The Concordia Prep boys' soccer team, which has moved up to the MIAA B Conference this fall after winning the 2016 C Conference championship, may be ready for the A Conference, if the first week of the season is any indication. The Saints opened with a 3-1 win over Archbishop Spalding on Monday and followed that up with a 1-1 draw with John Carroll on Wednesday. 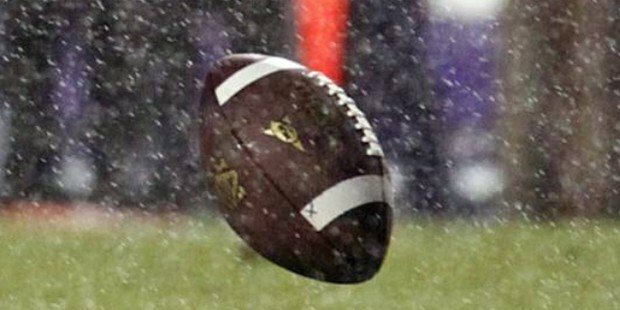 Aug. 26, 2017 - Saturday's scheduled varsity football game between host McDonogh and visiting St. Vincent Pallotti was cancelled because Pallotti did not have enough eligible players under the MIAA heat acclimatization standards. 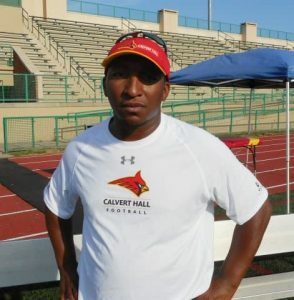 Aug. 26, 2017 - Calvert Hall football coach Donald Davis recorded his 100th career victory in the Cardinals' season-opening 45-0 win over Silver Oak Academy at Calvert Hall. Davis has just begun his 11th season at his alma mater after spending four years as the head coach at now defunct Cardinal Gibbons School. 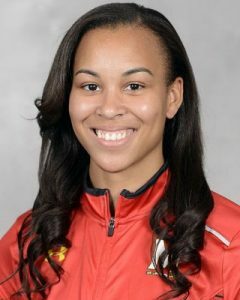 Aug. 22, 2017 - Aberdeen graduate Stephanie Jones, a sophomore for the University of Maryland Women’s basketball team, scored 14 points, Monday, to help Maryland to a 121-34 win over Uganda at the World University Games in Tawain. The Terps are representing the United States in the event. 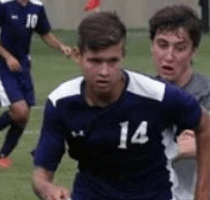 Aug. 18, 2017 - Brett St. Martin, a rising senior for the Mount St. Joseph soccer team, has made a verbal commitment to play his college soccer for the University of Maryland. 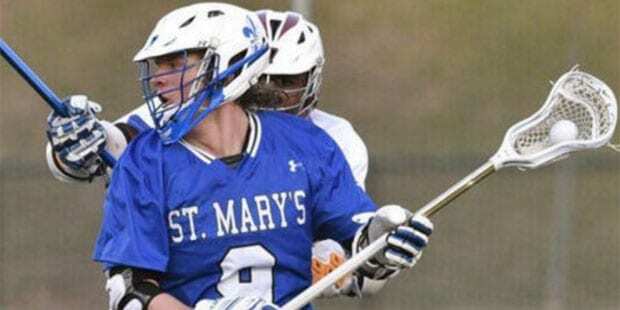 St. Martin, his plays for his father Mike St. Martin, is a center back and helped anchor a St. Joe defense that produced 10 shutouts while going 14-3-2 last fall and reaching the MIAA A Conference semifinals. St. Martin scored five goals and had four assists in 2016. 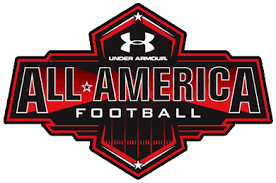 Aug. 17, 2017 - Baltimore players will help anchor the defensive front at the Under Armour All-American Football Game, to played in Orlando, Fla. in January. 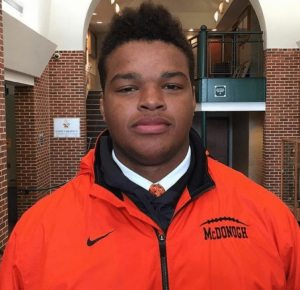 McDonogh's P.J. Mustipher, who committed to Penn State this month, has announced he will play in the contest, joining St. Frances defensive end Eyabi Anoma in the nationally televised all-star contest. Aug. 15, 2017 - Former Archbishop Curley and Temple University linebacker Avery Williams is turning heads in the Houston Texans' training camp, where he is attempting to make the roster as an undrafted rookie free agent. In a joint practice with the New England Patriots, at the Greenbrier Resort in West Virginia, Williams drew praise for three jarring hits during a punt coverage drill. This came after Williams had two tackles and forced a fumble in Houston’s first preseason game, Aug. 9, against the Carolina Panthers. Aug. 10, 2017 - After a one-year hiatus from Baltimore area high school football, former Gilman head coach Biff Poggi has officially returned, announcing that he will be the co-head coach at St. Frances Academy, along aside his long-time Gilman assistant Henry Russell, who guided the Panthers to the MIAA A Conference championship last fall. After 19 years and 13 MIAA A Conference championships, Poggi and the majority of his staff departed Gilman following the 2015 season. He invested significant resources into bolstering the St. Frances program before accepting a position as an assistant coach on the staff of Jim Harbrough at the University of Michigan, while his former staff led the Panthers to their first A Conference crown. Aug. 8, 2017 - Megan Callahan, who spent the last 20 years as the field hockey head coach at Johns Hopkins University has taken over as the new athletic director at St. Timothy’s School, replacing Kara Carlin, who departed this summer for a similar post at Friends School. Callahan, who won 223 games and three Centennial Conference titles at Hopkins, will also replace Carlin as the field hockey coach at St. Tim’s. Aug. 6, 2017 - McDonogh football defensive tackle P.J. Mustipher has made an oral commitment to play his college football at Penn State University. Mustipher is a 4-star prospect who is rated the No. 4 0verall prospect in Maryland and the No. 6 rated play in the nation at defensive tackle. Earlier this summer, he attended the invitation-only recruiting camp The Opening in Oregon, for the top 150 players in the nation. The 6-5, 290 Mustipher picked Penn State over a group of finalists that included Maryland, Notre Dame, Tennesse and Michigan State. Aug. 5, 2017 - St. Frances wide receiver Randy Fields, a rising senior, took to Twitter Sunday evening to announce his verbal commitment to play his college football at the West Virginia University. A three-star prospect, Fields is rated the No. 23 overall prospect in the state of Maryland by Rivals.com. Aug. 1, 2017 - One-time River Hill football standout Michael Campanaro, who has battled injuries throughout his brief NFL career with the Baltimore Ravens, passed his physical and has been cleared to begin practicing with the team. Campanaro, who has appeared in just 11 games over his first three seasons is battling for a roster spot as a wide receiver and kick returner. 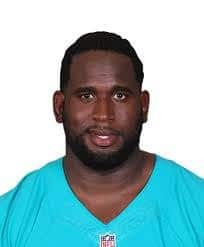 July 31, 2017 - Branden Albert, who played his high school football at Glen Burnie, announced his retirement from the NFL, after nine seasons. Albert, a left tackle who appeared in two Pro Bowls, was traded to the Jacksonville Jaguars in March from the Miami Dolphins. He played three seasons in Miami and six seasons with the Kansas City Chiefs. July 27, 2017 - "Baltimore Boys," the ESPN Films 30 for 30 feature on the famed Dunbar basketball teams of the early 1980's, is scheduled to premier on Aug. 8, 2017. The documentary was produced by former McDonogh School football sensation now turned filmaker Bobby Sablehaus. Sabelhaus was one of the most highly recruited quarterback prospects in the history of Maryland high school football while at McDonogh from the early to mid-1990's. Consider one of the best, if not the best high school basketball team ever, the Poets, coached by Bob Wade and featuring legendary players such as Tyrone “Muggsy” Bogues, Reggie Lewis, Reggie Williams and David Wingate went 59-0 over a two year stretch (1981-1983) and won a national championship. July 26, 2017 - The National Federation of State High School Associations (NFHS) has released its 2018 rule changes for spring sports – Baseball, Softball and Track & Field. 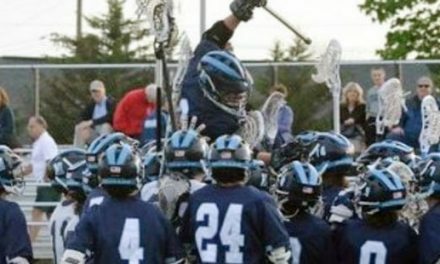 Changes for Boys Lacrosse are also expected soon. Read about it here via the MPSSAA. July 25, 2017 - The Capital Gazette's Bob Hough reports on the recent trip by Northeast High School student athletes Pat Martinek and Jayda Griffin to the NFHS National Student Leadership Summit in Indianapolis. Read more. BREAKING... June 26, 2017 - Mount St. Joseph basketball player Jalen Smith, the 2016-17 VSN Boys Basketball Player of the Year has committed to the University of Maryland. Read more. June 25, 2017 - C. Milton Wright rising junior Lauren Meyers, who help lead the Mustangs to the 3A State Softball Championship this spring, hit a game-winning two-run home run in the championship game of the USSSA U18 State Tournament at Rockburn Park on Saturday. June 21, 2017 - John Carroll lacrosse, which has won three consecutive MIAA B Conference championships, has been approved to return to the MIAA A Conference, considered by most as the nation's top high school lacrosse league, for the first time since 1993. The Patriots have been undefeated in league play the last two years. Moving to the A Conference has been the program's goal since it hired head coach Brian King away from Hereford four years ago where he won five state championship in six years. Since King's arrival, John Carroll is 56-25 overall. June 19, 2017 - Archbishop Spalding rising senior Chase Goff qualified for the 2017 U.S. 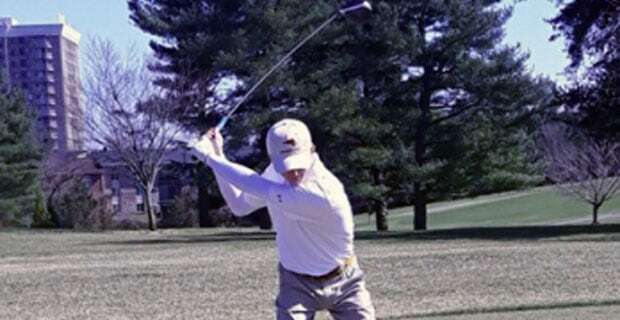 Junior Amateur Golf Tournament, shooting a 68 to top an 87-player field in a qualifying event at the U.S. Naval Academy Golf Course. 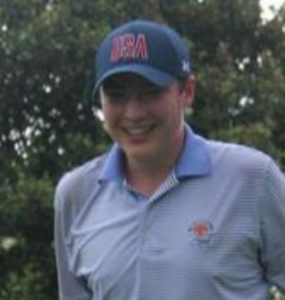 He will compete in the U19 Division the week of July 17 at Flint Hills National Golf Club in Kansas. South River’s Joseph Gaulin shot a 71 in the same event and qualified as an alternate for the Junior Amateur. Read more in the Baltimore Sun. VSN Lax Cast, absolutely FREE!